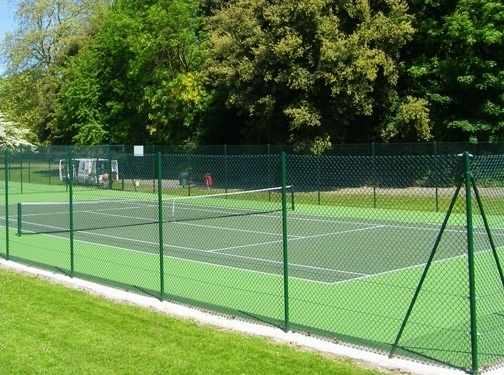 tennis court surfacing and other associated services, assisting clients across Surrey, Essex, Kent, London and the surrounding area. The experienced team draw from over 40 years" experience in tennis court construction and maintenance in order to ensure that all services are completed to a consistently high standard. Services offered include tennis court construction and reconstruction, general maintenance services plus additional extras, such as floodlighting, retractable floodlights, landscaping, paved steps, viewing areas and much more. Sovereign Sports work with clients on a personal level to help them create the ideal tennis court to suit their needs. Whether you are looking for first class tennis court fencing in Surrey or require assistance in tennis court maintenance in Kent and everything in between, get in touch with the experienced team at Sovereign Sports now for professional help and assistance. You can also visit the website for more detailed information on the services provided. UK (Rochester, Kent) based business - with over 35 years' experience - providing tennis court construction and sports surface installation services. Website includes details of services provided, "meet the team" information, work examples, associations belonged to, blog, full contact details including company VAT number.